Blank books can be decorated to make excellent journals. Finding blank journals to embellish can be a good way to put your paper crafting skills to use while creating a special gift. Pretty journals promote a love of writing in children and teenagers, while encouraging adult recipients to take the time to record their special memories. Office supply stores have a number of plain items, including blank journals. Discount stores such as Wal-Mart and Target typically carry a small assortment of journals in the stationary department. 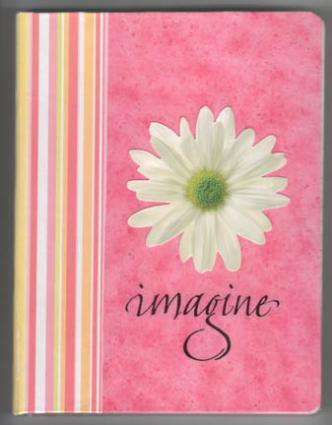 Dollar stores sometimes have blank journals or journals that can easily be recovered and decorated however you wish. Craft stores such as Hobby Lobby and Michaels Crafts may have journals with the paper crafting, scrapbooking, or card making supplies. Paper Wishes sells Sarabinders, blank chipboard binders that can be used to make your own journals, address books, or daily planners. Oriental Trading sells plain white hardbound journals with 100 pages in packages of 12. If you can't find a suitable journal available for purchase, consider following the tutorial on the Daydreaming on Paper Web site to make your own blank book. Choose the paper you want to use. Patterned 12x12 inch scrapbooking paper works well for this project, but you could also use wrapping paper, an old map, or one of your child's large drawings. Cut the paper to fit the size of your journal. You'll need three sheets of paper: one for the journal front, one for the journal back, and a thin strip to cover the journal's spine. Allow about ½ inch extra on the top and bottom ends so you can fold over the corners. If you wish, you may also cut two smaller sheets of coordinating paper to use on the inside of the journal. Adhere the paper to the journal using Mod Podge applied with a foam paintbrush. Smooth out any air bubbles before allowing the glue to dry. Apply a final coat of Mod Podge to the top of the journal to seal and protect the paper. Let your project dry for an hour or two. Add buttons, charms, flowers, or other dimensional embellishments as desired. Write the recipient's name in bold letters across the front. Add a memorable quote about writing. See the Quote Garden Web site for ideas. Incorporate a special photo into your design. Cover the journal with an eclectic collage that includes images of the recipient's favorite things, such as his/her favorite book, movie, food, hobby, etc. When giving a decorated a journal as a gift, consider using some of your leftover supplies to make a coordinating journal jar. Essentially, a journal jar is a container filled with writing prompts. The prompts may ask questions such as "What is your favorite childhood memory?" or "Who do you most admire?" The purpose of a journal jar is to help the recipient overcome the feeling of "writer's block" that often accompanies journal writing.